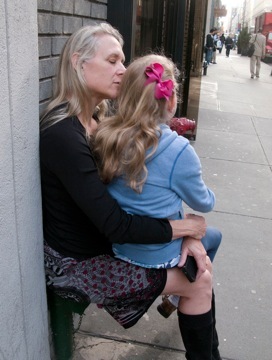 Our neighbor took this photograph of me and Em waiting for her school bus. I’m always astonished that Emma almost always gets the right number of “sleep, wake ups” before she can have pancakes on the weekend. I have even seen her count on her fingers, making me wonder whether we shouldn’t start implementing a math program – if I can find one – as it’s clear she is counting and figuring out how many times she’ll sleep and then wake up before Saturday morning. 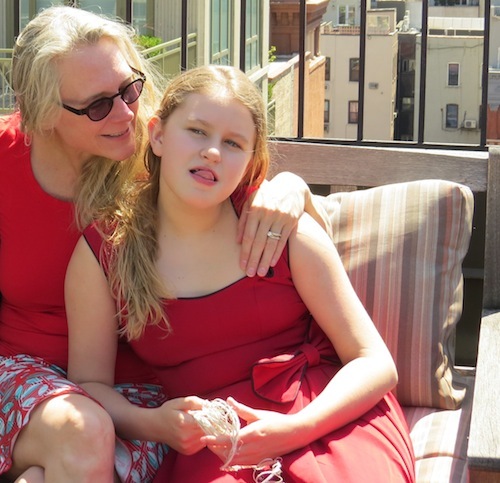 Much has been said about autism and “sliver” abilities, the sorts of things autistic children seem to be able to do at age level or above while most other things lag far behind. I am not referring to the much publicized, but rare, savants. 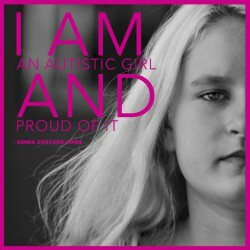 I’m talking about the abilities many autistic children have that surprise us, their parents. In Emma’s case it is her unbelievably accurate memory for people, places and things. She will talk about a preschool teacher she had when she was three and she has an uncanny ability to know when a favored object or photograph is missing. She seems to know immediately that not only a photograph is missing, but she knows which one with a glance at the pile of over 200 photographs. I have no idea how this is even possible. “Carousel photo?” Emma will cry. “No! Other one!” She’ll cry in frustration. We no longer doubt her. I cannot remember Emma ever being wrong about a missing photograph from her box of photos. She keeps them in a box the size of a shoe box and there are over two hundred photographs. I am constantly amazed with Emma’s mind. It can retain massive amounts of information and yet I still must remind her that she needs to dry her body off when she gets out of the shower. “Okay, Em. Now get a towel. You have to dry your arms and legs. Now dry your stomach and back,” I will say. What has become clear to me is that Emma’s mind is not something I can predict. I cannot assume she will know how to do something – rinse her hair after she puts shampoo in it – while at the same time I cannot not assume anything either. “Mona Lisa!” Emma said, pointing to a book with the portrait of the Mona Lisa on the cover. “What’s his last name?” I asked. Just around the time Emma was diagnosed I showed Emma a book on famous painters and their paintings. Over six years later she still could remember them.